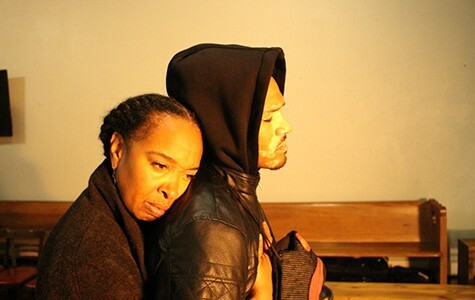 Dawn troupe (left) and William Hartfield play heartbreaking victims of gun violence in The Gospel of Lovingkindness. Ubuntu Theater Project's newest production, The Gospel of Lovingkindness, begins before you even enter the venue. The experience starts at the ticket booth, where the attendant gives a warning: "There will be a gunshot and a scream, and they will both be loud." The words could work as a poetic synopsis of the production, which is the first performance of celebrated Oakland native Marcus Gardley's newest script. It would be simple to say that the play is about America's urgent need for gun control. But that undersells the nuances of the script. The tightly wound plot centers on the death of Manny, a charismatic Black high school boy (powerfully played by William Hartfield) from modern day South Chicago whose parents work overtime to make the best life for him — even if that means sending him to a primarily white school on the other side of the city. Early on, Manny gets shot a block from his house. Throughout the beginning of the play, his mother, Mary (beautifully played by Dawn Troupe), lingers at the side of the stage, silently devastated. Her presence is a constant reminder of the trauma that ensues after such unexpected violence. Hartfield also plays the part of Noel, another high school-age Black youth from South Chicago. But Noel's circumstances are slightly more challenging — his father isn't around, his mother is overworked, and he needs money immediately if he wants to survive. Between cigarette puffs, his mother (one of many parts tightly executed by Halili Knox) advises him not to follow the story written for him, but to write his own. It's not easy though: As Noel attempts to avoid fulfilling a stereotype and becoming a statistic, he hits barriers at every corner. And on impact, he combusts with hopeless frustration. In one scene, Noel is denied a job by a dismissive Walmart manager who barely looks up from his phone to consider him, and breaks down into a crushing cry: "Look at me! Why won't anyone look at me?" 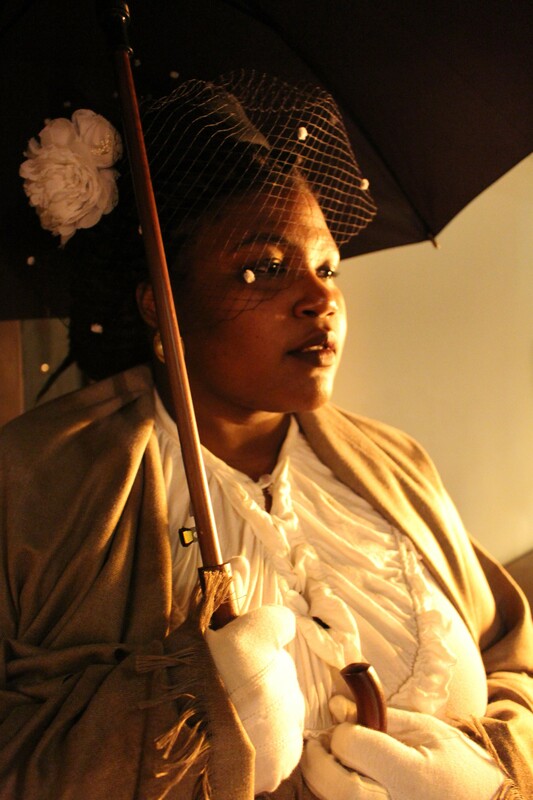 Rolanda Dene as the ghost of Ida B. Wells. Meanwhile, Mary meets the ghost of Ida B. Wells (Rolanda Dene) and becomes radicalized by her polemic speech on the broader, unjust circumstances that lead to Manny's death. "Someone's putting guns in their hands, putting them in the projects," preaches Wells. "It's a conspiracy." And for the rest of the play, Mary increasingly devotes her life to the cause of fighting gun violence. At times, the script is slightly heavy-handed as characters expound on the various factors of systemic inequality. But it does not come off as a piece with failed subtleties. Rather, it's unabashedly confrontational and explanatory — and at times even a call to action. That also does not make it less emotional. Ultimately, it's a worthwhile story about people. Gardley's script, as delivered by the Ubuntu cast, brings heart to cold data and lifeless case studies. It's intimate, too. The audience occupies a mere four rows of seating on either side of a small chamber in Oakland City Church (the cast does a remarkable job of delivering a 360-degree performance). The show is dimly lit, with candles that illuminate the warm, red walls of the church. Actors address audience members directly, and when they sing gospel songs (which happens throughout the play) it feels as if they are singing in a choir with you, not to you. By the end of the two-hour show, every audience member is implicated — literally participating in a vigil, mourning so many losses. Even someone already devoted to the cause would leave with a heightened sense of responsibility.